Fear not. I’m not going to indulge in happy talk about the joys of pregnancy. I am, however, going to share some ideas and resources that may be very helpful to expectant parents in NYC—and, when you add them all together, present a portrait for why this city can be a very good place to be during your journey from pregnancy to parenthood. The big theme here is you are not alone. This is a city with resources and qualified people who like to help. Of course this theme will carry on into parenthood, but let’s start with the bump. 1. Support Groups: Among the list of places I like to recommend for prenatal education, support, and wellness are 92Y, JCC Manhattan, The Moms Groups, City Births, Prenatal Yoga Center, Twiniversity, NYC Dads Group, and Birth Day Presence, among others. And keep in mind that many hospitals have classes too that aren’t only open to those scheduled to give birth there—and hospital classes are usually priced to be affordable. 2. Neighborhood Parent Groups: There are some neighborhood groups that are so robust that people pay an annual fee to access their online discussion boards (such as Park Slope Parents and Hudson River Park Mamas). Do a Google search (and a Facebook search) of your neighborhood and parent groups, and you may unearth a treasure of helpfulness. Or, frankly, if you like the idea of having a readily available online community but your neighborhood doesn’t have a good one, join a parent group from a nearby neighborhood (and of course BabyCenter.com and WhatToExpect.com have great boards as well). 3. Hospitals: I already mentioned their support groups and classes, but of course the bigger bonus is that the city is dense with good hospitals with good NICU units. Some of the hospitals also have birth centers, with environments and procedures that are more in keeping with home births. These include New York-Presbyterian/Lower Manhattan Hospital and Mount Sinai/St. Luke’s. 4. OB-GYNs & Midwives: There’s no shortage of OB-GYNs in NYC. Many women find their OB-GYNs through word of mouth, but all the major hospitals also have referral services. There are a good number of experience midwives in the city. Google, plus word-of-mouth, will get you started. 5. Doulas: For some pregnant women, a doula is the best thing that ever happened to them—and I just love the idea of having a trusted and supportive adviser and an advocate for any stage of the birth journey. There are a lot of experienced doulas in the city, too. There are also several services which provide free or affordable doula care to women with low incomes. Google it. 6. Lactation Consultants: The New York Lactation Consultant Association (NYLCA.org) has over 300 members in the New York area. There are other kinds of certified breastfeeding advisers, notably from La Leche League of New York (lllny.org). Again, Google and word of mouth can help, but you might want to research your list of recommended lactation advisers while you’re pregnant, so you’ll have it when you need it. 7. Maternity Clothing & Breastfeeding Gear Retailers: NYC has everything from the maternity fashion equivalent of a big box store (Destination Maternity) to boutiques like Rosie Pope Maternity and Seraphine. There are also stores like Yummy Mummy and The Upper Breast Side that address all of your breastfeeding needs, including popular nursing bra and clothing brands. 8. Baby Gear Stores: The big boxes are Babies“R”Us, buybuy BABY, and Target. The outstanding independents include giggle, Albee Baby, Wild Was Mama, Sprout SF, and Mini Jake. 9. NYC Dads Group: We mentioned them already in the support group item, but it is worth highlighting the good work of NYC Dads Group, which offers a Boot Camp For New Dads, and ongoing social and educational events once you become a father. Tell the expectant men in your life about the Boot Camp, which covers practical challenges like diapering to broader ones, like work/life balance and establishing a successful parenting partnership. 10. New York Baby Show: The largest consumer event in the country for expectant and new parents (and their bumps and babies), the annual New York Baby Show returns to the city this year on the weekend of May 20-21, 2017, at Pier 94 (near West 55th Street and the West Side Highway). It is a grand family-friendly cavalcade of top products, beloved speakers, and all sorts of fun and helpful attractions. 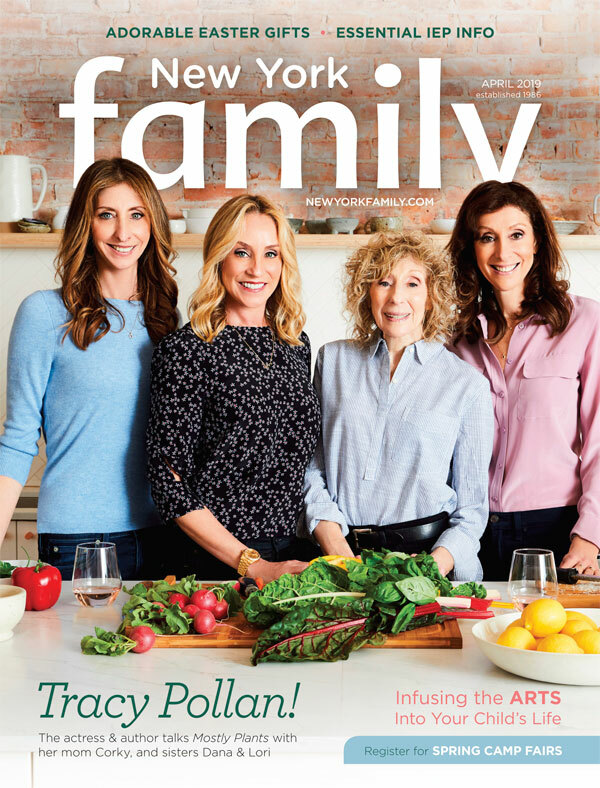 New York Family magazine produces the Show—and I’m especially proud of how it’s priced to be affordable ($30 per family; $20 per individual) and how welcoming it is to everyone—men and women, singles and couples, families and friends, urbanites and suburbanites. You can read more about it at newyorkbabyshow.com. And Then Comes Baby: I will share my list of “10 Reasons It’s Great To Be A New Parent In New York City” on at a later date, but it’s worth mentioning the big themes here. All that support I talked about in the points here? Much of it continues and is expanded on in all kinds of parent & me classes, and all the new families you’ll meet at local playgrounds, and all around the neighborhood, including in your building. Invariably, you will start to develop a new parent posse who’s experiencing a lot of the same joys and challenges that you are. Of course, your pediatrician will become one of the most important people in your life. Find one that you like; there are many great ones in the city. You will always appreciate the support and help and generosity of others, but in time the big theme changes from: “You are not alone,” to: “I got this!” It’s all very exciting. Eric Messinger is the editor of New York Family. He can be reached at [email protected].